Growing up, you likely heard that it’s what is on the “inside” that matters most. Or maybe it was the more, colloquial version, “Never judge a book by its cover.” Regardless of which one sounds more familiar to you, timber frame home owners and craftsman alike embrace these truisms every day. 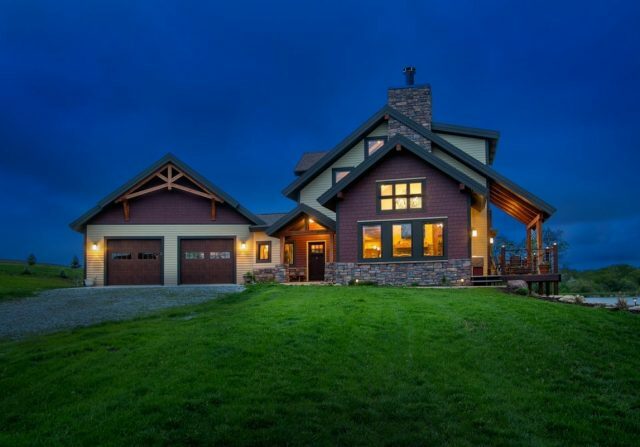 This is because, (stunning exteriors aside), each Riverbend owner and timber artisan knows that much of the astonishing beauty of a timber frame home is found on the inside. 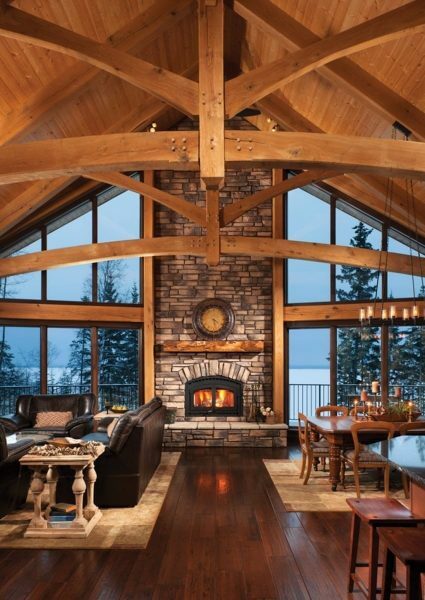 Timber framed interiors do more, however, than simply leave first-time visitors speechless. Authentic timber frames support the interior of your home, and assist in defining your living spaces. Those who work in the craft of timber framing know that the interior space of a timber frame residence is first defined in terms of trusses and bents. This article details exactly what trusses and bents are, what each adds to the architectural detail of a timber frame home, and shares examples of bents and trusses both as individual elements of a timber frame skeleton and as part of a timber frame home. What is a Truss? What is a Bent? A truss is created when multiple timber members that fit together. The members of a truss include rafters, king and/or queen posts, chords, collar ties, braces, and finials. This truss unit spans and supports your roof structure. A bent is created when a truss is joined to the posts that connect the truss to the floor. Examples of standard truss styles are shown below, along with details explaining the appeal of each. To watch a short video of how Riverbend assembles a timber frame bent, click here. Utilizing the fewest amount of truss and bent members, a King Post truss system consists of a simple triangular shape with an intersecting piece in the middle. A King Post truss is Riverbend’s most beloved style. Its clean lines offer a cross-generational appeal and beautifully blend with more than one style of architecture. By arching the chord (the bottom member of the truss), our craftsmen create an entirely new feel to your home’s interior. The versatility of the King Post truss is well known. The two examples above are illustrative of the King Post’s adaptive style. Working from the basic elements of the King Post, the Queen Post truss offers additional wood-to-wood connections. The combination of these connections and lovely bents creates a softer, and perhaps more refined, appearance to the vaulted ceiling of your Riverbend home. Additionally, more than one architectural style can easily incorporate Queen Posts, particularly if you prefer European or Craftsman home styles. Also known as a Hammer Truss, clients who prefer a more modern feel often choose to incorporate Hammer Beam trusses. An unique feature of the Hammer Truss and Bent system is the fact that the bottom chord is divided into two separate chords. The result is a sharper, more angled appearance that also happens to be more architecturally inclined. A Hammer Beam truss can incorporate braces, finials, or metal tie rods, to add intricate detail and structural strength to the structure. The intricate workmanship put into every cut and connection of a hammer beam truss is on elegant display in your home. True to its moniker, the Scissor Truss is comprised of sharply steep angles. Scissor Trusses beautifully compliment vaulted ceilings on the inside of your home and deep eave overhangs on the outside. Repeating the Scissor Truss system throughout the length of your home’s interior, gives the open spaces extra height. Designers and architects who are familiar with timber frames, enthuse that Scissor Trusses provide extraordinary character. Reflecting the warm spirit that traditional timber framing exudes, the Barrel Truss uses smaller timber members to create a semi-circular opening. Whether used for structural purposes or added design, the Barrel Truss draws your eye upward making the open spaces of your home appear even larger. 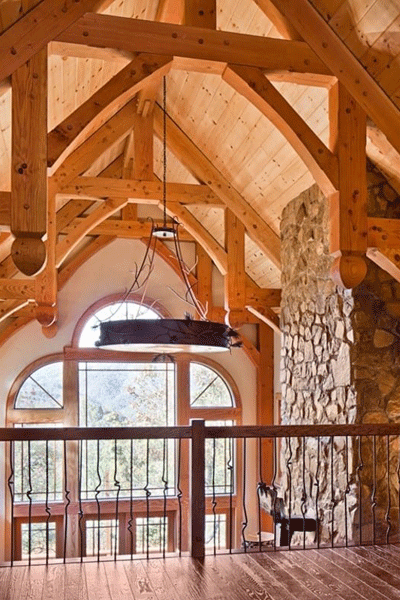 Barrel Trusses are known for bringing a graceful influence to a home’s architecture. Not seeing the truss of your dreams? Interested in combining elements of multiple truss styles? We can do that for you. Variations of the traditional truss styles shown above can be used by your architect or our architectural designers. For example, trusses using a combination of King and Queen posts are popular. Custom trusses are not uncommon at Riverbend and are used to create unique interior spaces. See a Riverbend home in Missouri that features a one-of-a-kind truss. 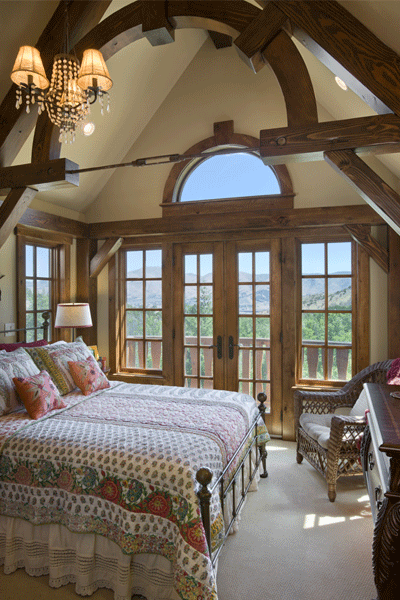 You may also find inspiration in our Anatomy of a Timber Frame Home webinar. You can view the recording here. Timber species, depth, stain, and additional decorative carvings are also frequently paired with truss and bent systems. These fine touches add further unique characteristics to your home’s interior. 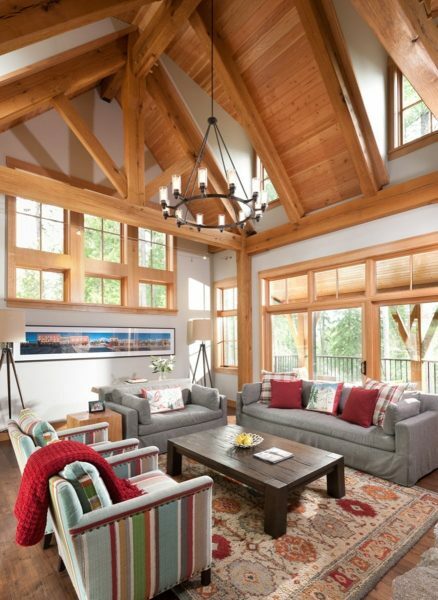 Robust or elegant, complex or simple, a timber frame’s truss and bent sets the tone for your interior spaces. By working with your architect or with ours, you will discover the perfect truss style to reflect your distinct style. 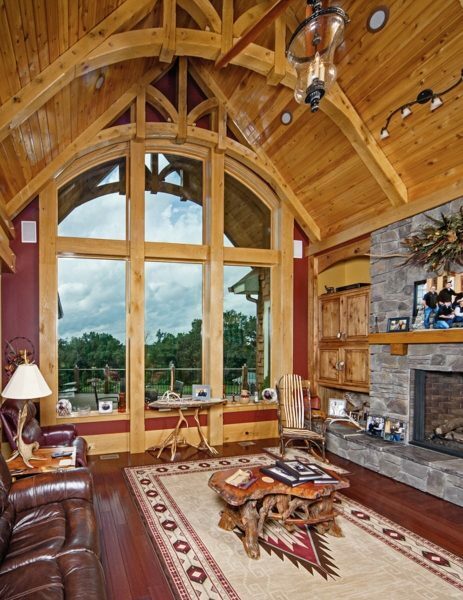 Riverbend Timber Framing, Your Style Reflected.